Freshly put out onto the shelves at my local Walgreens, was the holy grail that is the Tink Collection from Nicole by OPI. Can I just tell you all that when I discovered that Nicole by OPI was coming out with a Tink line, I literally squealed while I was at work. Whoops! Yes, I was THAT excited. So upon coming across the display that hadn't been touched (at least it didn't look it), I went back and forth (this seems to be a reoccurring thing with me), trying to decide which to purchase first. Sadly, the other colors reminded me of other polishes that I have, I'll most likely go back and purchase them anyway though! The one that I picked first was.... Drum Roll! 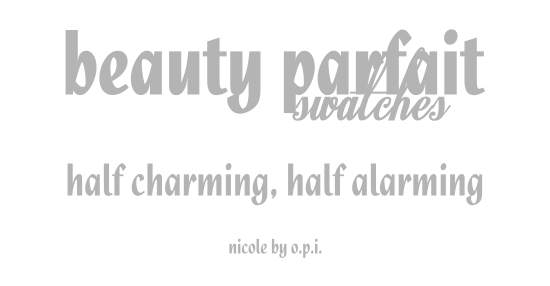 Half Charming, Half Alarming! Best way to describe this color is that it's alarming! Haha, not really. Definitely in the warm family, but I'm on the fence as to whether to say this is a terracotta colors or a tomato red color. It isn't quite red, but not orange either, it's definitely a mix of the two. Terracotta Tomato perhaps? It's a color that I don't recall having, not to mention it gives you a very polished look. Formula: This is where I fall into the iffy area. I love Nicole by OPI polishes, but I'm not sure what happened with mine. Perhaps it was because of the heat? This is a sheer formula, I want to say it's jelly, but not jelly. It was also being a bit of a fuss-pot with applications, occassionally doubling over an area would cause balding to occur, or drag marks (maybe the brush is a mini car). It dries down to a semi-matte finish. Well actually, the first layer was matte, the second layer had minor gloss to it. Easy-peasy clean up though. In the swatches below, I only used 3 coats. I definitely could have done a 4th coat to get it fully opaque, as I still see some of the white tip of my nails.